The fun never stops for Anna Wintour! Days after the editor-in-chief of American Vogue hosted the annual Met Gala (A.K.A. "Fashion's Biggest Night") on Monday, she was off to Buckingham Palace in London. The 67 year old met with Queen Elizabeth II Friday and was bestowed the honor of damehood. Naturally, the fashionista dressed in a Chanel coat (onto which the queen pinned a medal) and donned her signature sunglasses. Everyone's talking about how she also sported a rare smile. 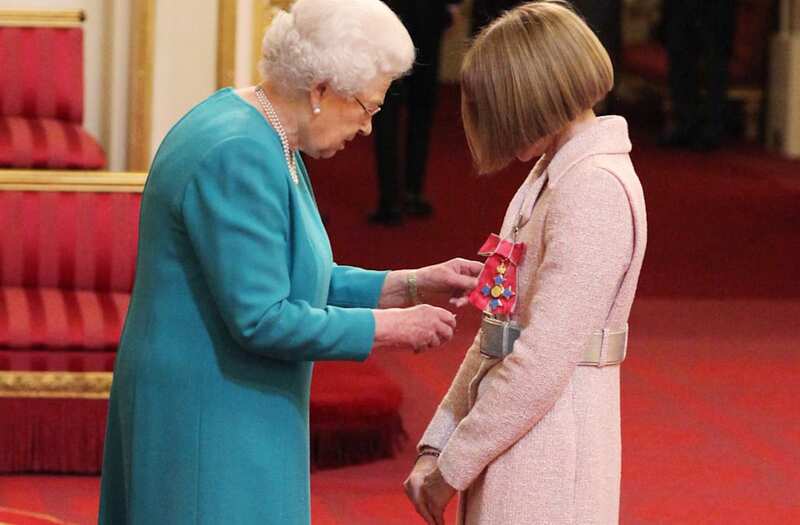 Dame Anna Wintour is made a Dame Commander of the British Empire by Queen Elizabeth II, during an Investiture ceremony at Buckingham Palace, London. Following the ceremony, Wintour's newly engaged daughter, Bee Schaffer, proudly posted a photo of her mother modestly standing with her decorated outfit. Rumor has it the editor-in-chief also took the time to thank Queen Elizabeth for Prince Philip's "inspirational" service one day after he announced his retirement from royal duties.